The Braddon fire captured from the street below by Louise Savage. Photo: Facebook. There have been calls for the ACT Government to urgently bring forward the procurement of an aerial ladder appliance, known as a Bronto, after a fire last night at the top of an under-construction, high-rise building in the city. The fire has reignited concerns that the ACT, with its ageing and unreliable Bronto increasingly out of action, has been left exposed to a major calamity without sufficient resources to fight a blaze or conduct rescues at height. The fire broke out on the 12th floor of the Founders Lane building on the corner of Cooyong Street and Ainslie Avenue in Braddon at about 6 pm, and could be readily seen from the street below. It is believed members of the public alerted ACT Fire and Rescue, which attended the scene, but with the Bronto again in the workshop after returning from Sydney last week, firefighters had to carry a hose up flights of stairs to the top of the structure to extinguish the fire. 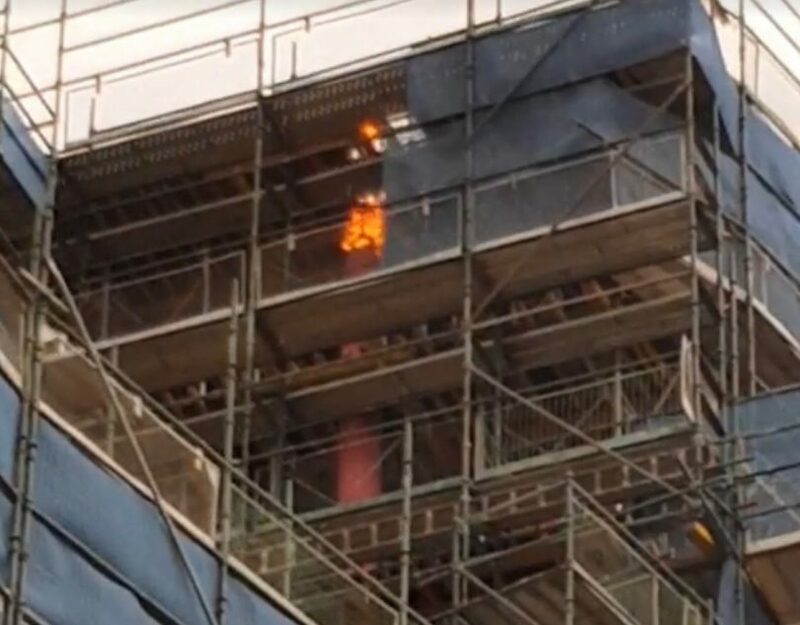 A fire broke out on the 12th floor of the Founders Lane building on the corner of Cooyong Street and Ainslie Avenue in Braddon at about 6 pm yesterday. Below is footage of the fire, which was quickly contained, provided by Louise Savage. No workers were in the building when the fire broke out. The Bronto was unavailable which resulted in firefighters having to carry a hose up flights of stairs to the top of the structure to extinguish the fire. ACT United Firefighters Union Secretary Greg McConville said that if the Bronto had been available it would have doused the fire very rapidly.”The fact that firefighters had to climb so many flights of stairs to get there would have prolonged the duration and hence the damage caused by the fire,” he said. “A Bronto would have enabled a much quicker attack on that fire.”The union had warned the Government many times that the Territory’s fire-fighting resources were not keeping up with the city’s rapid urban development.”The more often this happens we edge closer to the grim possibility that someone will get hurt. There is only so long that you can ride your luck in incidents of this kind,” he said. The danger for firefighters was that if the fire spread they might not be able to descend, ‘and that’s a very real concern in a building that is not complete’. Minister for Emergency Services Mick Gentleman only last week fielded questions in the Legislative Assembly about the Bronto being out of action and acknowledged it was a problem, after previously saying there was no need for a replacement. The Bronto is ageing and unreliable. File photo. Mr Gentleman told the Assembly that attempts to source a back-up vehicle from Victoria and NSW had failed. He said he could not say when a new Bronto would be delivered, saying it was a long gestation period to acquire such a piece of equipment. The union welcomed the Minister’s change of heart on the need for a new Bronto but said procurement should be fast-tracked as a matter of urgency in light of the continued unreliability of the current appliance. “It’s a welcome change in tune but good intentions aren’t going to save people who need saving from a multi-storey building fire,” Mr McConville said. Founders Lane developer JWLand said the incident was in the hands of fire investigators and WorkSafe and it would await their findings. Head of Development Michael Prendergast said the company did not know how the fire was started and damage was limited to a corner of the building. He said a couple of square metres of timber formwork had been burnt out but there had not been any structural damage. “We’re quite lucky the site is open today with everybody allowed back on site, which shows it had minimal impact,” he said. Mr Prendergast said no workers had been in the building when the fire broke out, with the site locked down from 4 pm. “We’re pleased that the fire brigade got there as quickly as they did,” he said. Mr Prendergast said firefighters had told him they would have used the Bronto if they could have. It was the first time there had been a fire like this in any of the company’s projects. 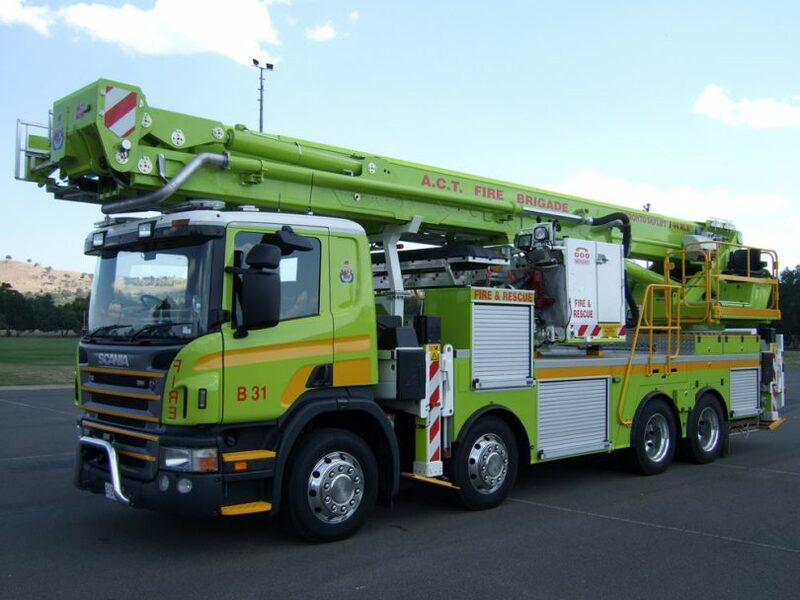 There is a current Government tender for a minor aerial pumper appliance, for use in medium-rise environments, to be delivered in late 2019 or early 2020, with a major aerial appliance or Bronto to be purchased at a later date. The Budget papers show $2 million has been allocated to 2020 for the aerial pumper but there is nothing allocated yet for the other appliance and no timeframe for its delivery. The union has argued that it should be paid for out of the Fire and Emergency Services Levy, which is set to bring in $90 million by 2022. Mr Gentleman said in a statement that the Emergency Services Agency had advised him that the ACT’s fire service remained well equipped to safely respond to building fires. “The fire yesterday evening was safely contained and I would like to thank our dedicated firefighters for this,” he said. The ESA was considering options with its Vehicle Replacement Program to replace the current aerial appliance as soon as possible. The ESA said it intended to have the new aerial pumper appliance on the road in the 2019-20 financial year. ESA Commissioner Dominic Lane said the purchase and commissioning of this important second appliance was a priority for the agency. “The current ACT Fire & Rescue (ACTF&R) aerial appliance is at ESA workshops where a scheduled quarterly service is being carried out. Additional work is also being undertaken to diagnose a reoccurring electrical fault,” he said. Another case of poor vision by the Barr Government! PJ Fleming gotta worry about where the money's going... to whom? No accountability... No deliverables. The mind just boggles. Eventually we got a line of 38 mm hose on the fire 🔥 to deal with it. No internal hydrants, bronto out of action. Not a great combination. Stephen Newham they like making it difficult for you don’t they! Lucky you are all up to the job!! Krystal Eppelstun-Lee what is happening?? Anyone remember the film "Towering Inferno"? Paul Newman played the Fire Chief and I can still recall him complaining about the height of buildings and the capacity of the fire department to be able to put fires out in them. We should stick to lower level buildings, it's much safer. Maybe with all of these new high rise apartment buildings going up there is going to be more need for ladder appliances. To meet this need a levy on the construction of high rise buildings to purchase said trucks might be worth considering? Thank god it was a construction site and not occupied apartments. More confirmation that the ‘responsible’ minister is out of his depth. Surely with all the planning for higher densities and taller buildings, blind freddy could have foreseen the need for an new aerial appliance? And so where DOES all the additional fire levy money being raised go then? Funny how I thought general household rates were already supposed to cover essential city services – you know, like our fire services. Amazing how this mob just keep tacking on additional new fees. How about: City beautification fee? (i.e. mowing & garbage collection) or maybe Road upgrades surcharge (i.e. vehicle registration).